Please support our efforts to end the financial exploitation of my elderly 83 year old father by the judicial system in Rock Island, Illinois. Case number 11P35 in Rock Island, Illinois. Our case has been dragged through the courts for the past year at our expense. We have been ordered by Judge Clarence Darrow to pay three different lawyers concurrently, including the court appointed guardian ad litem who consistently opposes all of our wishes. Thus far we have paid tens of thousands of dollars to lawyers upon the orders of Judge Darrow. This is a simple guardianship case that has been financially exploited beyond belief. The judge and attorneys have openly discussed the excessive attorney fees associated with this case, laughing and saying that we have the ability to pay more! Our story began in 2010 when we met with an attorney to discuss guardianship. This meeting was predicated by the loss my father’s wife to cancer after 38 years of marriage. Dad was grief stricken and had suffered a heart attack. Dad is 83 years old. He was in and out of the hospital over several months during this time. I initiated the guardianship proceedings because of this, and because dad owns a small business that he was unable to care for during this time. Dad has owned rental properties for the past 50+ years. 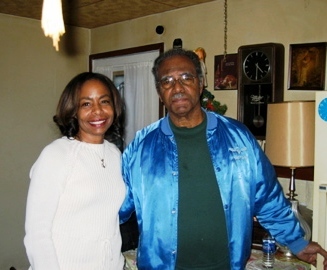 Dad’s attorney advised him that if he agreed to a Limited Guardianship that I would be able to manage his affairs and that dad’s rights would remain in tact. So upon the advice of his attorney, dad signed a consent for a limited guardianship. There was no finding or adjudication of disability. Almost immediately after the papers were signed, the court appointed guardian ad litem Thomas Blade told us that dad no longer has any rights and that he is now a Ward of the Courts. In addition, the guardian ad litem opposes all of dad’s wishes for the management of his property, saying that the Courts are better qualified to manage dad’s property. Once the Courts learned that my father owns a fair amount of rental property, they started going after his property as well as running up excessive legal fees. With the consent of Judge, the guardian ad litem has used the judicial system to create excessive legal fees and to deny us of our rights. We are seeking your support in this matter. We will NOT receive fair treatment in the Rock Island justice system without the support and influence of others. Please sign our petition and support my elderly father! : IL Judicial Inquiry Board and US Judicial Branch: Stop Judge and Lawyers from exploiting my elderly father!